Once again, Tara had it when she was younger but I can understand her not remembering. I love Acorn Squash. I never had it with maple syrup before. Just with brown sugar and butter. You can also microwave it and it turns out pretty good. Nothing beats it baked though. You should try banana squash. That is pretty delish too. Spaghetti squash though? Not so much. I’ve actually had spaghetti squash before, and I think I liked it (though this was a long time ago). 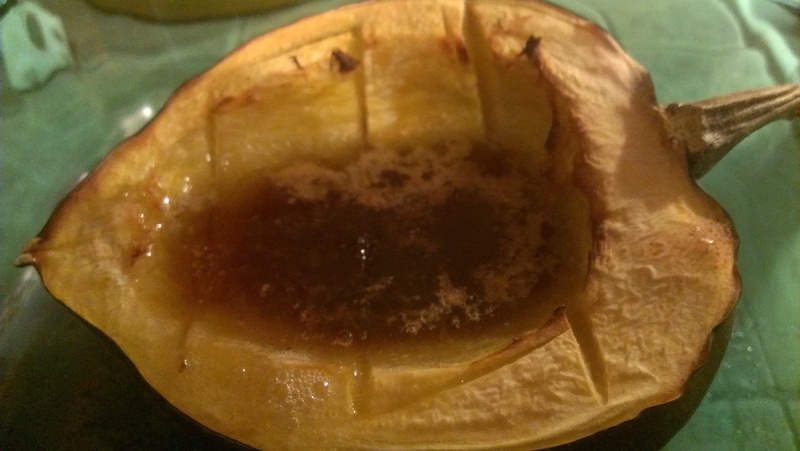 The maple syrup perfectly complemented the brown sugar and butter, giving the whole squash a caramel-like flavor that was delicious. This would make an excellent side dish at Thanksgiving! Spaghetti squash is just that. Stringy, like spaghetti. I guess the texture was too weird for me. Even with butter, salt and pepper and I can’t remember if I put brown sugar on it, it just didn’t taste good.